Doors open at 10:00 AM. Program starts at 11:30 AM and the program concludes at 1:00 PM. $35 per ticket. Tickets go on sale in January. 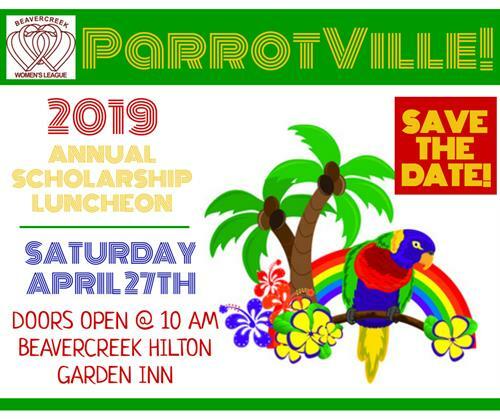 The community is invited to join with the members of the Beavercreek Women’s League in attending the 36th annual Scholarship Luncheon on Saturday, April 27, 2019, at the Hilton Garden Inn, Beavercreek, Ohio 45324. Ticket prices are $35. Proceeds from this popular event support scholarships awarded to graduating female seniors in the Beavercreek High School Class of 2019 and grants to adult Greene County women in transition who are returning to school to further their education. Since the first BWL scholarship luncheon was held in 1983, nearly $137,000 has been raised by the organization, including $69,500 for women in transition.